the best way to mount my passenger pegs with this set up? Im guessing they are a high mount bracket for the exhaust (were on there when i bought the bike). Didnt think about it until i already bought the passenger pegs and they were in route to me. 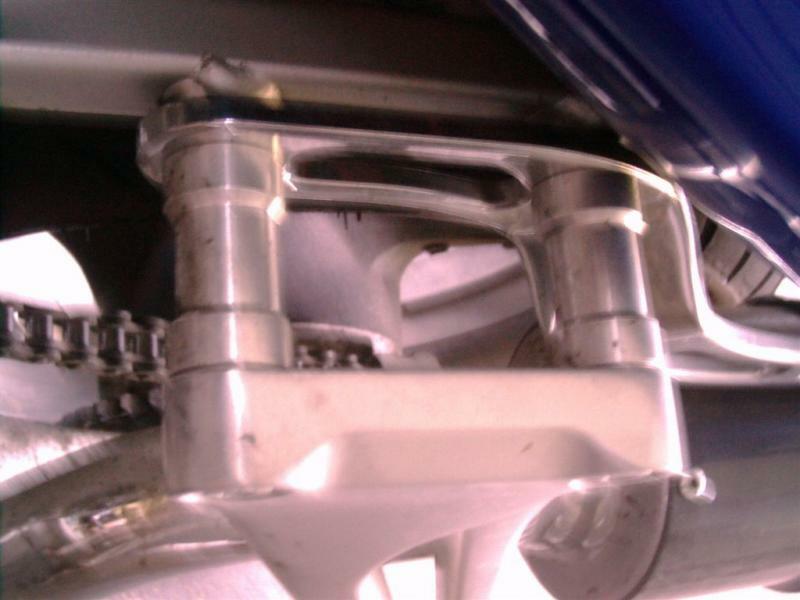 Would there be a simple way to mount the passenger pegs with the set up, or would i have or just go and find some stock exhaust mount brackets? Im sure there is a simple way of doing it and im just not seeing it. Looks like you got it with that last picture. Just use some longer fasteners. Then cut off that unsightly ear that the stock exhaust used to bolt to. 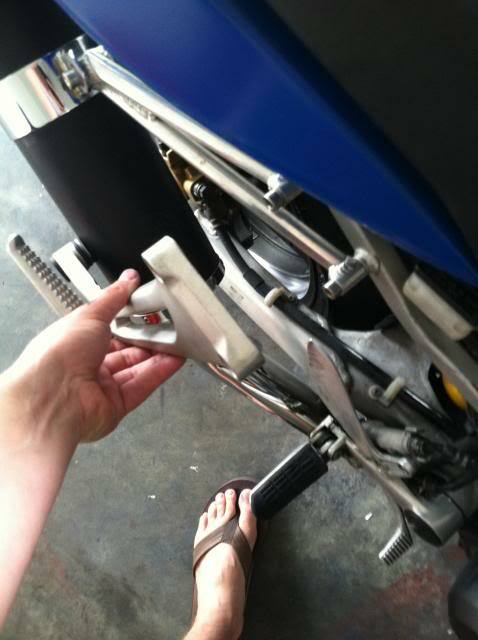 Or, if that won't work for ya, perhaps make a plate that relocates the footpegs down a hair. 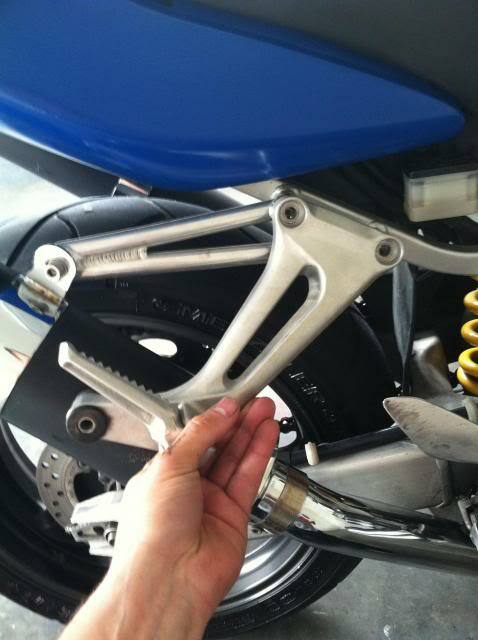 The plate would be sandwhiched between the exhaust hanger and subframe. The passenger pegs would then bolt to the plate. Or, take the existing exhaust hanger off and put the stock passenger peg/exhaust hanger on, then make a bracket that holds up the current mufflers. Without having it in my hands, that's just the first few things that popped into my head. well i have over come my brain fart and figured it out. I just loosened up the bracket around the exhaust and move it down some and then bolted up the whole passenger peg lol, worked just fine. If you want to keep the higher mount look you'll need to use longer bolts and spacers to space out the pegs past the mufflers. Those look like two brothers hangers. They didn't sell them but companies like Jardine and LeoVince and other did make them. I know myself and others have posted pictures of what the spacers look like in the past. Or you could just do what I think you did and remove the tbr hangers and mount them to the passenger pegs like stock. Last edited by captainchaos; 05-29-2013 at 06:43 AM. No need for pegs. According to the new safety regulations female passengers are now required to sit in the front. Male passengers have been forbidden. FWIW, that tab that the stock exhaust goes on is a perfect place to put a set of frame(exhaust) sliders. They have saved my carbon fiber cans several times. 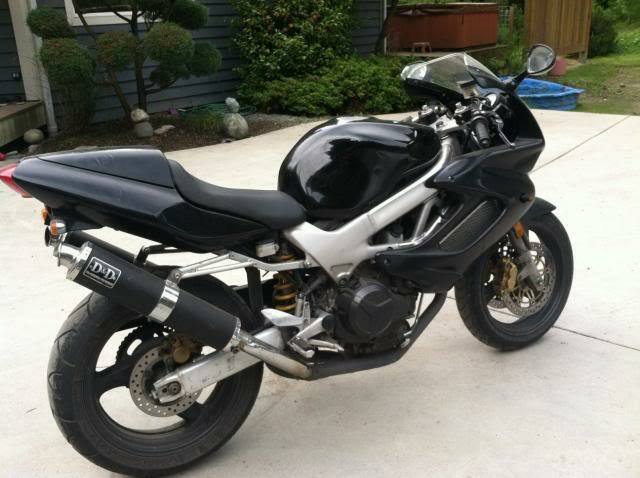 How Would You Rate the 01' Superhawk for a 1st Bike?